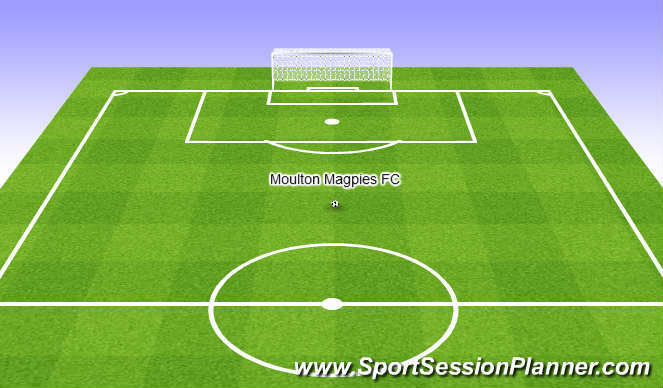 Two teams work in seperate halves of the pitch with a target player on the opposite side. Each team should complete 6 passes between themselves before looking to play the ball ALONG THE GROUND to their team mate in the end zone on the opposite side. Receiving end zone player plays the ball back in to his team mates who start the sequence again. Change player in the end zone regularly. Things to look out for & encourage; use of whole area, good movement to exploit space and receive a pass, weight and accuracy of pass, communication. Players should always be on the move including the target player. A - In this practice the central receiving player performs a &apos;Go to Show&apos; movement. 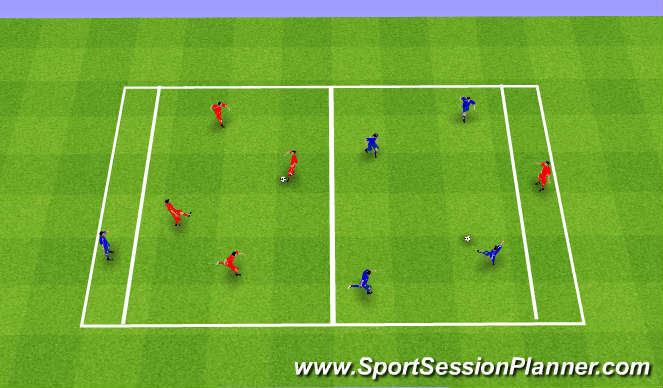 The player sprints away before turning back sharply to receive the ball on the half turn and then passing it on to the other server.The receiving player should let the ball come across the front of their body controlling the ball with the inside of their back foot. Perform left and right side. B - In this practice the central receiving player performs a similar movement to A but the imaginary defender is to close to execute a turn. The receiving player must create a &apos;long barrier&apos; controlling the ball with the outside of the foot furthest from the defender creating maximum distance between the ball and defender. The server makes a run to the side to receive a pass from the receiver before playing a pass to the server at the other end. C - In this practice the central receiving player performs a &apos;Show to Go&apos; movement. The receiving player moves in close to the server dragging the defender with him to create space beyond the defender before turning and sprinting into the space beyond to receive the pass. Unlike A & B which require close control to execute the pass this requires a positive first touch out of feet to exploit the space at pace. An opposed practice with the aim of playing the ball into the target player to score a goal by receiving the ball in front of, with back to and beyond defenders as per the technique practice. Encourage and look out for good movement such as &apos;Go to Show&apos; and &apos;Show to Go&apos;, a good first touch to get the ball under control or positive touch out of feet if running beyond defender. Try to use first touch to move the ball away from pressure and look to make use of the floaters on either side of the pitch to switch and stretch the play. Look for good supporting runs and verbal and non verbal communication. 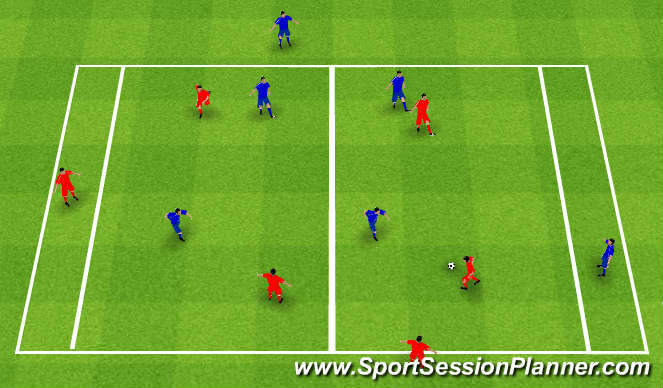 Receiving beyond the defender - Move towards team mate with the ball dragging in the defender before turning quickly and sprinting into the space beyond the defender to receive the pass. Positive first touch out of feet to attack space at speed and get away from defender.